Spring is upon us, the bulbs are up, the days are getting longer and the beauty and peace of The Cotswolds awaits you. Free bottle of wine with every new booking. The Vine is a warm haven from which guests can enjoy the beauty of the Cotswold villages and walking paths. We have enjoyed welcoming guests to our home over the last three years and all guests have been impressed by the attention to detail and luxurious appointment of this property. Enter via you own entrance onto the limestone floored sitting room, slip your shoes off and enjoy the underfloor heating whilst resting on the Heals of London hand made sofa catching up on the sport via the wall mounted 50 inch TV. The stairs lead to the bedroom suite, the inviting John Lewis King Size Bed is topped with the finest thread count Egyptian cotton sheets and quilted covers, view from the window is toward Cleeve Hill the highest point in the Cotswolds. The Bathroom has a slipper bath and separate shower, underfloor heated Travertine tiles will keep you warm with views to Langley Hill. Fancy cooking or a takeaway, you can dine at the granite topped dining table with wall lighting by Jasper Conran, no need to do the washing as a dishwasher is provided. 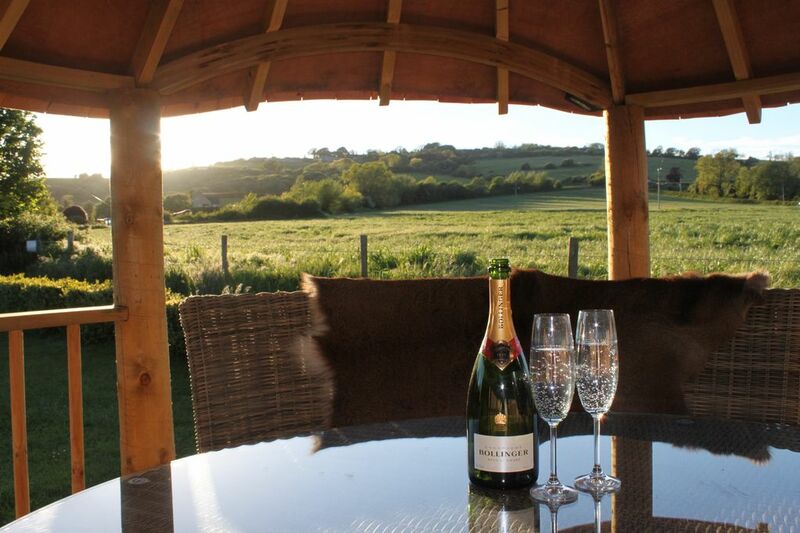 The landscaped terrace is yours to enjoy with a bbq or just relax with a glass of wine from the fridge; beyond the terrace the lawn backs onto open country fields and Cotswold Hills. Winchcombe is one of the most genuine and pretty Cotswold villages. Fortunately, Winchcombe is not not the main tourist trail and therefore it is less busy than some of the most well trod Cotswold villages. What is does have is all the beauty but with none of the crowds of day visitors. Winchcombe's origins go back as far as Anglo-Saxon times and it was once famous for its wool industry. The stunning Sudeley Castle is located in Winchcombe and well worth a day visit. Home of Lady Ashcombe and once home to Katherine Parr, Sudeley is indeed a must on your to-do list. The town is blessed with numerous pubs and restaurants with a good range of food from traditional pub grub, gastro pubs and first class elegant dining. You can eat in a different place every night of the week all within walking distance of the cottage. Access to Cheltenham Racecourse is just 10 minutes over Cleave Hill. Cheltenham is home to the most famous jump racing circuit, Prestbury Park. The famous Cheltenham Festival takes place in March each year and is known as the shining jewel in the jump racing calendar. If you can't make it in March there are many other race days to attend during the year. Cheltenham Spa should definitely be on your "to do" list, with its café culture and wide boulevards, excellent shopping and impressive Georgian architecture. Now home to The Ivy restaurant, but remember to book ahead. Cheltenham is lucky to be the location of many 'Festivals' each year. These are often advertised on the BBC. The Jazz Festival in May, Science Festival in June, Music Festival in July and the Literature Festival in October. It is worth booking tickets if you are staying during one of these peak periods. All events are well worth attending and take place in and around the impressive Montpellier Gardens. If you like classic cars you will love Prescott. Prescott Hill Climb is just a short drive away in a neighbouring village and if the weather is fine there is nothing better than a day with a picnic on the hillside watching the classic cars race up the circuit. If Steam Trains take your fancy, we are well positioned with Winchcombe's very own steam train and station. The Gloucestershire Steam Railway website will have more information and a timetable of events. A little further afield but all within an hour's drive is Stratford Upon Avon, Warwick Castle, Blenheim Place and the beautiful city of Oxford. Paul and Amanda fell in love with Winchcombe when they moved here in 2002. In 2007, shortly after the birth of their second daughter, Paul spotted the potential in a property on a large plot that became available on Langley Road. Together, we have transformed the property into the family home with luxurious guest accommodation which it is today. Langley Road is a one of the quietest roads in Winchcombe. It is situated to the south west of the village and we are fortunate to see more tractors and horses on the road outside than cars. The light and airy interior mingles with the garden and fields beyond the French doors at The Vine. Through the large French windows you can sit and enjoy the sunset over the garden. Once dark, look up through the beautiful skylight in the sitting room to admire the constellations. Or from your own sunny patio you can sit quietly with a glass of wine and listen to the birdsong. The Vine has been running successfully as a holiday cottage since 2014 and with a background in the hotel industry Amanda knows how to look after her guests whether that is in the cleanliness & boutique hotel feel of the property or in her local knowledge of where to dine or what shows and festivals are on in Cheltenham or surrounding villages. Upon arrival you will receive a welcome pack with recommendations of places to visit during your stay. In the fridge you will find fresh bread, orange juice, milk, a bottle of wine and sparkling water. For a small additional charge, two gin & tonics and two beers are also provided. In the larder a selection of teas, coffee, sugar, flour, cooking oil and rice are also provided. Tea towels and washing up cloths are a thoughtful addition. For people who enjoy cooking a single induction hob and combination microwave oven are also provided. You really only need your own fresh ingredients which can be bought from the local grocery store. Parking is a premium in Winchcombe and many properties are unable to offer a designated parking space. The Vine can offer you secure off road parking for one car at the property address. From The Vine it is only a short 5 minute walk into the centre of Winchcombe where all the amenities, shops, pubs and restaurants are. For some people they park up and really don't use their car all stay as Winchcombe is in the heart of the Cotswold Walking Route and one can escape into the countryside as soon as you step outside the property. If you need somewhere to store your bikes or wellie boots, additional space can be provided. Quiet Location within a short walk of the town centre. Stunning new hand made Breeze House over looking the beautiful Cotswold escarpment beyond. Lighting and Heating within this beautiful bespoke Breeze House just at the end of the garden for your private enjoyment. Take a bottle of wine and watch the sun set over the hill beyond. Off road parking provided on our paved driveway. Secure off road parking is a rare find in Winchcombe and certainly a unique benefit of this property. toilet, tub, shower, Bath has shower attachment. The Bathroom has a slipper bath and separate shower, underfloor heated Travertine tiles will keep you warm with views to Langley Hill from the large window to the rear of the property. A White Company large bath sheet and hand towel is provided for each guest. Highly effective central heating and underfloor heating throughout the property. You can control the heating to your desired level. Due to the expensive nature of our linen. A charge will be made if linen or towels are soiled beyond normal wear and tear. Off road parking is available for one car on site. White Company or John Lewis Bath Sheet and Hand Towel per person. Enter via French windows into the limestone floored sitting room, slip your shoes off and enjoy the underfloor heating whilst resting on the Heals of London hand made Sofa catching up on the sport via the wall mounted TV. Yes a slimline dishwasher is available. An undercounted fridge with freezer compartment. A small single ring hob is available. Fancy cooking or a takeaway, you can dine at the Granit topped dining table with wall lighting by Jasper Conran. Fully fitted kitchen with a range of cupboards and drawers integrated appliances include combination microwave, fridge/freezer and dishwasher. We have Free View Channels available. There is a stereo speaker for your to plug your iPod or phone into. Yes DVD player and DVDs are located within the television cabinet for your use. A library of used books are available for guests to read and share. Scrabble and a pack of cards for guests to use. A DVD player with a range of DVDs are available within the tv cabinet for guests to use. A large private garden with fantastic Cotswold views beyond. The Beautiful hand-made breeze house is located at the far end of the garden. Perfect to watch the sunset. A private terrace for guests use with table and two chairs. There are a number of local golf courses, the closest is Cleeve Hill Golf Club which is 1 mile distant. Others include Shipton Golf Club, Lilley Brook and Naunton Downs Golf Club. We look forward to welcoming guests from near and far to The Vine in 2019. Our guest book and online reviews reflect the exceptional quality of the accommodation. Please note this property is non-smoking and suitable for couples only. Excellent secure off road parking on the paved driveway. Housekeeping included. This property will be cleaned upon your departure. No additional charge will be made for this. Lovely accommodation in a lovely place. Good base for walking. Very peaceful break and helpful host. We spent 5 days at The Vine in early December. After sightseeing & walking in the cold & in heavy rain, The Vine was a lovely, warm, comfortable place to return to. The location is surprisingly quiet but also provides good access to Winchcombe which is just a short walk away. Loved the roof lantern, spacious bedroom & views from the living area. Many thanks to Amanda for all the goodies. We had a brilliant week at this warm and comfy holiday accommodation: The Vine. No complaints at all and we would recommend this property. We wanted a base so we could walk from the door into the countryside every day and The Vine was absolutely perfect. I discovered Winchcombe when watching a Julia Bradbury television programme. She suggested the town was an ideal base to literally walk in all directions on a variety of routes. So I went on line to check out the accommodation and was so grateful I came across The Vine. Winchcombe is an ideal base and The Vine is a wonderful holiday accommodation. We had a great long weekend. Very relaxing. Paul and Amanda were welcoming, helpful and friendly and added to our our whole experience of Winchcombe. Restaurants, pubs and castle all in walking distance. The Vine is a perfect location for people who enjoy cycling and walking in the beautiful Cotswolds. 14 miles to Moreton-in-Marsh with direct trains to London. 0.5 mile to the town centre of Winchcombe. Winchcombe has a number of upmarket pubs and restaurants including the Michelin starred Restaurant 5, the 15th Century coaching inn 'The Lion Inn' and the beautiful Tudor House that is The Wesley House Hotel with its AA ** rosette restaurant. Prescott Speed Hill climb is home to one of the world's most prestigious motor racing venues and holds a number of classic car and bike weekends throughout the year. Prescott is a short drive away. The historic Sudeley Castle with its award-winning gardens and over a thousand years of history is open April to October and is well worth a visit. For steam train enthusiasts the Gloucestershire Warwickshire Railway has its own stop in Winchcombe and holds many family events throughout the year. Booking Notes: Book Direct with us. Full payment is required within 3 weeks of booking. A 50% deposit is required if an enquiry is made outside the three weeks. Minimum 3 night break. Changeover Day: Friday or Saturday changeover preferred. Notes on prices: The cottage default price is £80 per night for a minimum of 3 nights and £450 for a week in high season. Bank Holiday weekends, The Cheltenham Gold Cup and Paddy Power race weeks will attract premium rates. Please request prices on application. Please check the price with us if you hope to stay longer than seven nights. We will only accept week long bookings throughout July and August 2019. . The guest accommodation is an extension of the owner's family home and therefore we ask guests to remain quiet from 10pm onwards.